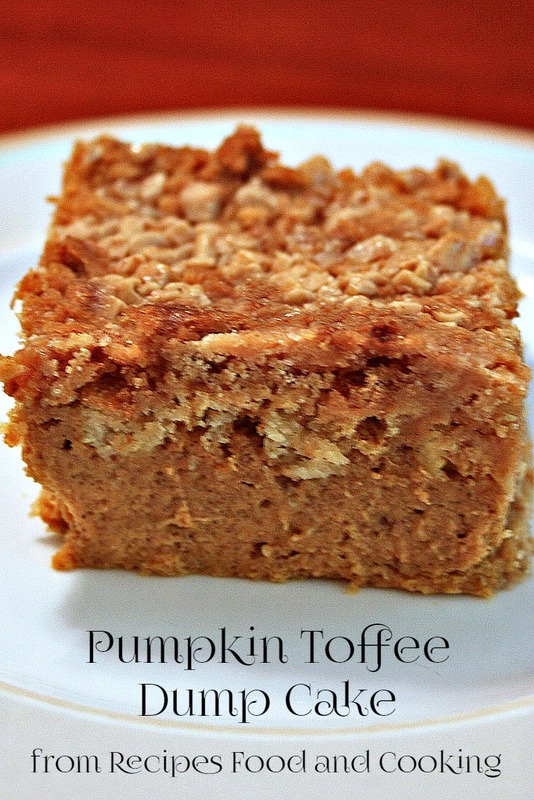 Pumpkin pie bottom with a cakey, crunchy toffee top makes this Pumpkin Toffee Dump Cake an easy to make family favorite. I made this recipe the other day and it is amazing! All of the flavor of pumpkin pie but in cake form. My sister in law came right after I made it and she may never make another pumpkin pie she said. It is also going to be on her Thanksgiving table. 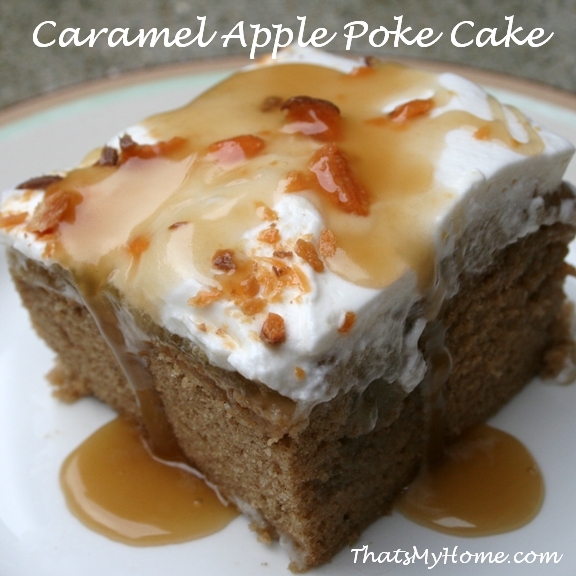 About the only thing that could make this better is a toffee dessert sauce to serve with it. 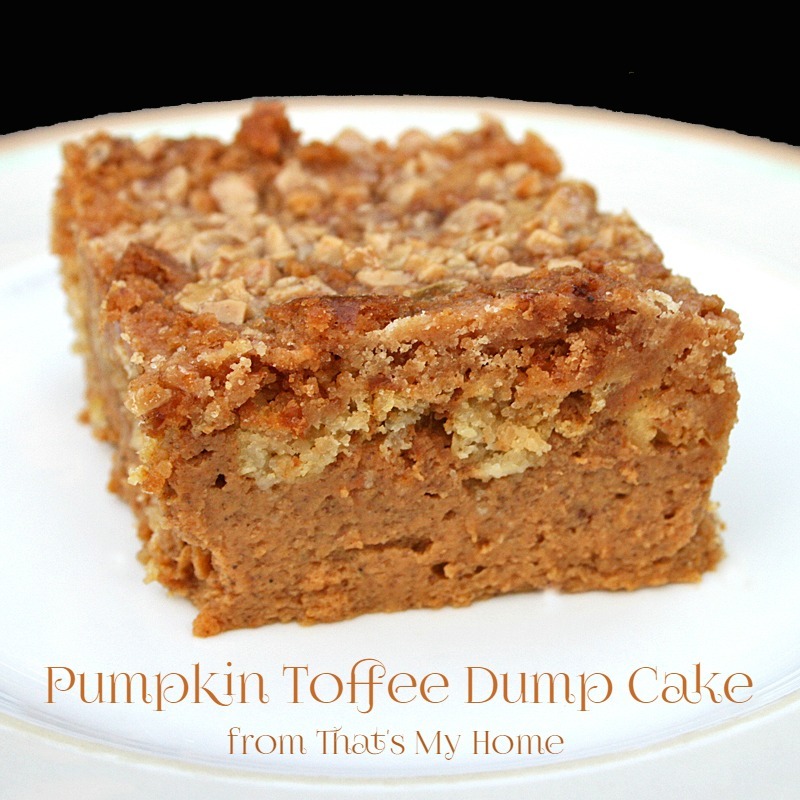 Pumpkin pie bottom with a cake, crunchy toffee top makes this Pumpkin Toffee Dump Cake an easy to make family favorite. Spray a 9 × 13 baking pan lightly with cooking spray. In a large bowl combine the pumpkin, evaporated milk, sugar, eggs and spices. Stir to combine. Pour into your prepared pan. Sprinkle your entire box of cake mix on top, followed by graham cracker crumbs and toffee chips. Pour your melted butter evenly on top. Bake for 50-60 minutes until center is set and edges are lightly browned. Combine butter, sugar, and cream in a medium saucepan and bring to a boil over high heat. Reduce heat to medium-low and boil, stirring frequently, until sauce thickens and darkens slightly, about 4 minutes. 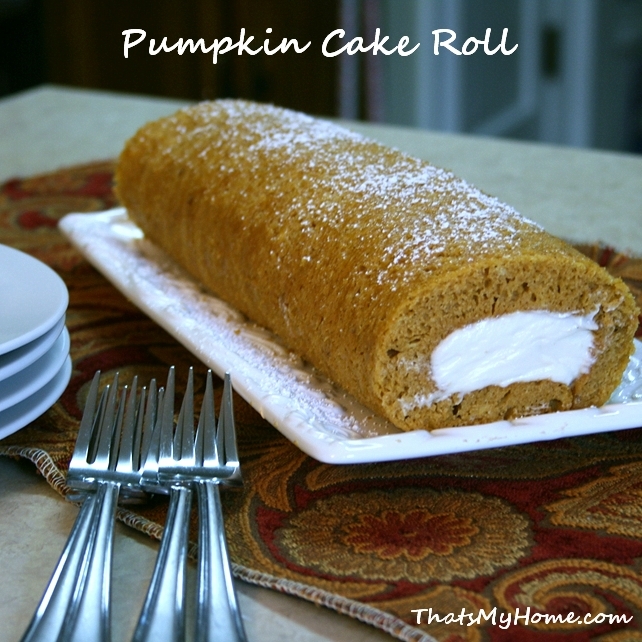 or maybe this recipe for our Pumpkin Cake Roll? well, Mary Ellen, this dump cake looks really delicious! Glad you posted at the Friday With Friends link party. I’ve pinned, liked, twittered and G+-ed your post. I’d love it if you dropped by for a visit at http://www.kneadedcreations.com . I look forward to seeing you over there! Deb @ Kneaded Creations. Hi Deb, thanks for all of that! I will be over to see you this week. Holy smokes this looks fantastic! My family would love this. Great job. i see your recipe for date nut bars, they look delicious. I have been looking for years a date nut cookie my grandmother used to make, it had a soft dough filled with chopped dates and walnuts, after baking while still warm, she would cut into bars and dunk in powered sugar. They were awesome! I can taste them as I describe them. Your recipe may be the one, thank you! Hope so! This was my great grandmother’s recipe from the 1930’s I think. Let me know! So do I pour the toffee sauce over the top? Or drizzle it on the plate after I’ve put a piece on it? I put some on the top and pour it too after I put it on the plate. Is the sauce poured over the baked cake, and allowed to be soaked into the cake, OR is it just to be drizzled on top when served? Recipe does not include what to do with it. Just drizzled over the top. Thanks so much for your yummy looking recipes. Question on the Pumpkin Dump Dcake–I’veonly seen 5 oz. and 12 oz cans of evaporated milk. Do you mean 10 ounces or are you using a large can thinking it is 10 and not 12 ounces. Thanks and again, thanks for sharing.